The ride quality and comfort from the semi-active suspension is class leading, especially when ridden two-up. Over bumps and imperfections it’s almost alien like – it’s that good and smooth. It’s not all about the clever suspension either, the ABS is excellent, so is the traction control and changeable rider modes, and it's all wrapped in an excellent chassis with a powerful 125bhp V-twin at its heart. It might not be the best looking bike on the market but the ride quality is one of the best. The semi-active suspension on the new Caponord is more advanced than any other system on the market. The Ducati and BMW systems only adjust compression and rebound on the move whereas the Aprilia system also changes preload. This isn’t for ultimate performance but for comfort and ride quality. The end result is really impressive, amplified further with a pillion or luggage, bumps and imperfections almost disappear. It’s a really impressive system, one of the best on the market, if not THE best. When you up the pace, the sporty handling is impressive, too. It’s possibly not as sharp as Ducati’s Multistrada, but still more than adequate with excellent ABS-assisted brakes and traction control. The 90 degree 1197cc V-twin is very similar to the engine used in Aprilia’s Dorsoduro, but refined and re-mapped to give more midrange performance. Maximum power is a quoted 125bhp @ 8500rpm and maximum torque is 85ftlb @ 6500rpm. There are three engine maps: Sport, which unleashes full power, Touring, which gives the rider full power but a softer response and Rain which limits power to 100bhp. Aprilia claims the new engine is 20% more fuel-efficient than the Dorsoduro motor. The Caponord shares a very similar motor to the Dorsoduro which has been proven over recent years without any major reported problems or nightmares. Sachs controls the suspension and electronics which have had extensive testing and should be glitch-free. Overall, the level of quality and components used is high. The only slight downfall is the amount of UK dealers for parts and servicing, therefore check where your local dealer is. For the full spec bike with semi-active suspension you need to opt for the Travel Pack model, priced at just under £13,000. For this you get traction control, electronic suspension, ABS, different fuel maps, panniers and Brembo brakes. The standard model doesn’t come with the active suspension. 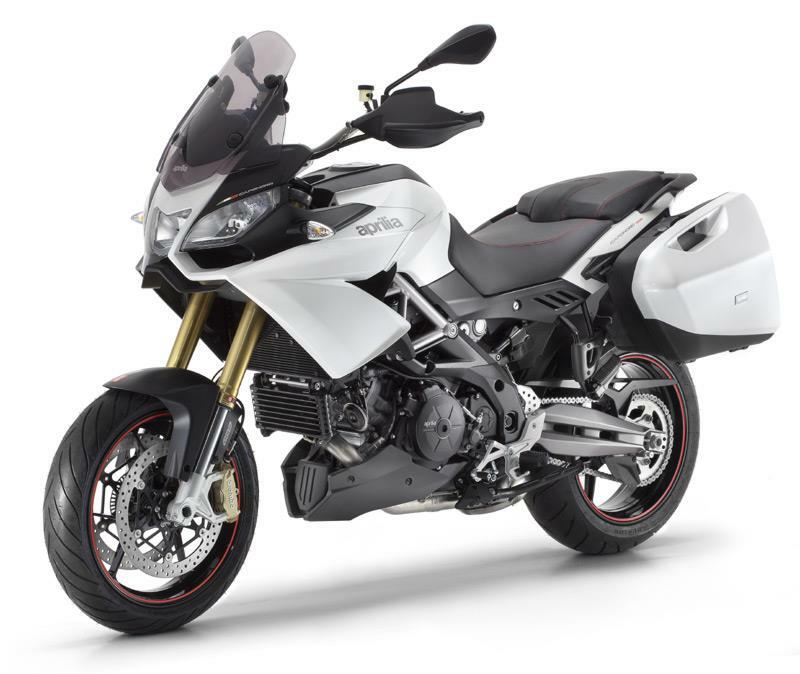 The Aprilia comes with a huge 24 litre fuel tank, the largest in this segment of adventure bikes. The Caponord is also iPhone compatible with a built in USB socket and Bluetooth. 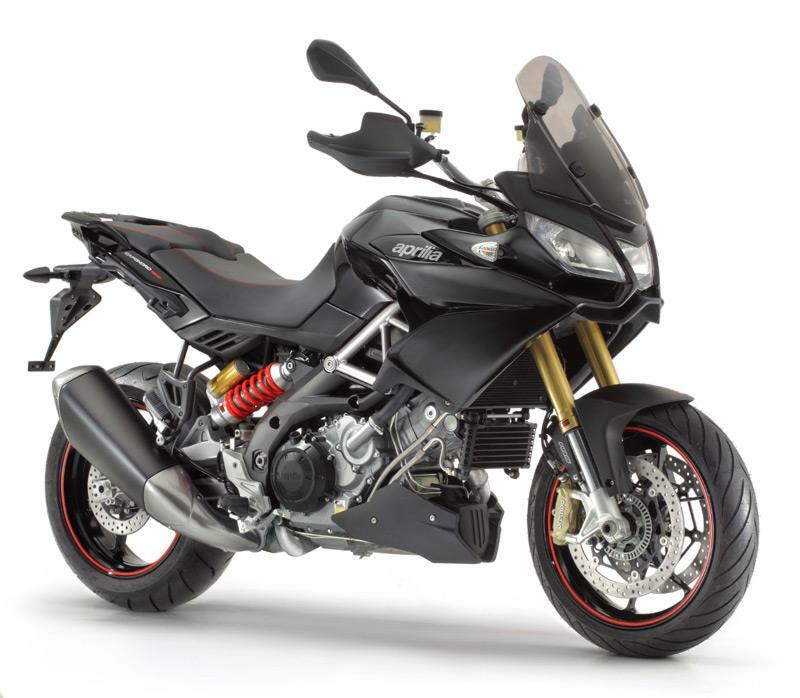 By downloading an Aprilia Caponord app you can store the bike’s data, like wheel speed, rpm or the amount of traction control intervention and also watch this information live as the bike has a top yoke bracket to accommodate your iPhone. There’s also a huge list of accessories, as you’d expect for a touring model. 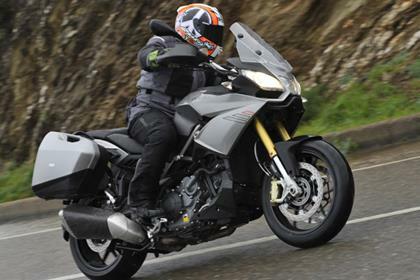 8 owners have reviewed their APRILIA CAPONORD 1200 (2013-on) and rated it in a number of areas. Read what they have to say and what they like and dislike about the bike below. It's 125 horses are harder top find than the BMW1200's, but the motor is much smoother and revs freely throughout its range. The suspension is superb as is the design and look of the bike. Very comfortable and very well equipped as standard. its a heavy bike so the brakes have to work hard but do the job. Comfort is top notch, i am able to ride until fuel is needed (around 180 - 200 mile mark). The bike uses a noticeable amount of oil, but is smooth and free revving. Looking at dyno tests on line the engine develops about 107 BHP at the rear wheel. This seems like quite a drop from the 125BHP claimed for the engines output, but it is all usable. The fuel gauge is a known problem, giving up reading through the float sticking in the slider tube. This has recently been solved with A replacement and revised part. Apart from that it appears well screwed together. not had an annual service as yet but for a top premium bike the cost of purchase and running are very good. Loads of standard equipment which you would pay £1000s for with any of the other top marques. I had the centre stand fitted as an extra for £138. cannot argue with that! In 2012 we were in the process of updating our Guzzi Stelvio so off to the dealers to test all the available "adventure style bikes. Tried em all and the only one that came close to the Guzzi was the Caponord. My wife and I travel Europe and ride together year round so pillion comfort is a key feature. 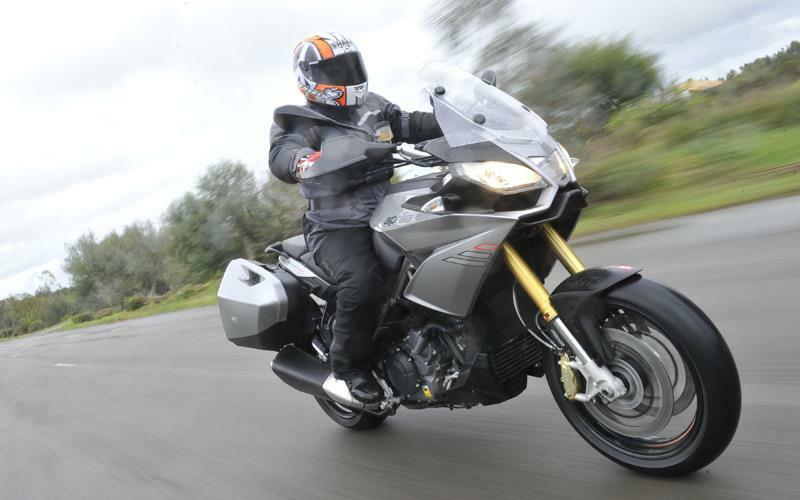 Within 5 mins of our 2nd test ride the Caponord had blown away all the competition inc the new Guzzi NTX. 3 yrs and 14000miles on we know we made the right decision. For us it is the perfect long distance European mile muncher yet also a supreme upright sports bike with all the luggage removed. The handling and ride is class leading. This is for me the best choice for what I want from my bike and is the best value for money against the competition. I was a little concerned about the vast array of electronic gizmos on board but not one single glitch so far. We chose the travel pack with some added goodies mentioned later all that for 12.5 grand and we are on the road !! Considering the spec and all the rider aids which all work so well this has to be the best value adventure style bike out there. I have no intention of going off road on a bike weighing 200+ kilos, for me that's insane so the 17" wheels are better for purpose. The bike came shod with Dunlop qualifiers and the rear was gone in 3000 miles. A change to Bridgestone T30s has halved the wear rate. In the first 600 miles the fuel consumption was also really heavy but at the 1st service Aprilia sent out a new complete suite of software inc new fuel mapping. Since then we are getting between 43-55 MPG fully loaded and not hanging about. The Caponord Rally is captivating, with its sharp good looks, ease of handling, value for money and a cracking engine with a throaty exhaust OMG. Its sooo under stated to its compeditors. Buy it Best Bike in this type you will have had. After 7k in 3 months I now know that. Nothing less than excellent I ride the Rally with the 19 inch front wheel having never ridden on a 19 before I was cautious but no need this bikes suspension is special I have covered over 7000 miles in 3 months so I am not just a Sunday biker. The 1200 motor is the companies original Mille 1000 bored out which was used in the Dosaduro 1200 with no noticeable problems. It has a vg range of power and free revving, unlike the V4 engines which have had valve dropping problems (back right usually). The Caponord engine is prob their most reliable. Aprilia finish is vg, quality parts top brembo brakes and top suspension. No problems to moan over so far with over 7k on the clocks. Bike comes fully loaded with 3 boxes at 14k but offers are out there. The standard Caponord is now £9999OTR, crazy CHEAP. Caponord Rally comes pretty much fully loaded, cruise control 3 boxes active suspension as standard. Heated grips add £125. No Centre stand though that's an extra too. Bought from Jim Allan Motorcycles in Scotland very friendly and informed staff. Well established dealership. Try one! You will like it. This Italian styled bike does it all. From performance to comfort its a peach. 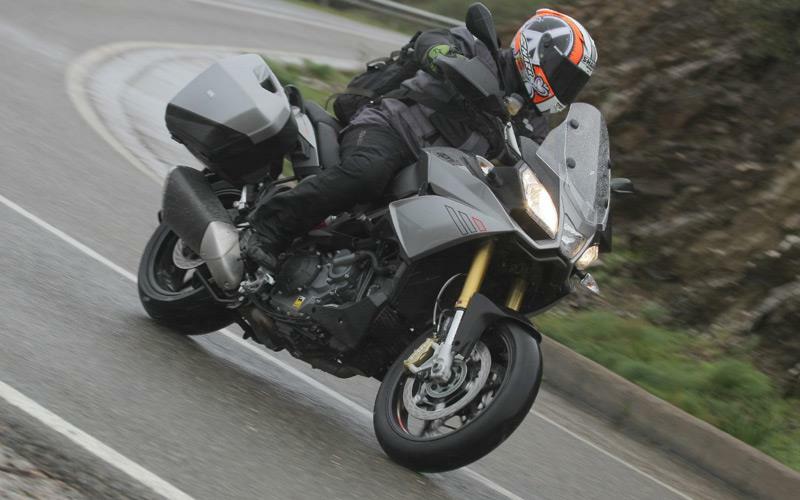 AAS Aprilia Active suspension is superb, almost same, as what is on its more expensive rivals BMW and Ducati. Best brakes on offer on most bikes at present Brembo. Super comfort its a ride all day machine whether on ur own or 2up. Whether with luggage on or not. Bike is dam light and easy moved, not like a GS. Its a rascal when stripped of luggage on the twisties and that exhaust is dam noisy too. Big grin factor guaranteed. 125 bhp plenty for all that your going to use it for. Easy 135mph if you require it. Easy power delivery bike has full traction control but I switched it off. This bike is easy to ride fast. Also left AAS in full auto setting. Big V twin engine has sufficient power and engine braking to inspire confidence on twisties. Build and reliability to date after 5k miles has been superb. No issues. Rally to date has been super cheap to run. With its 1st service at 600 miles next service 6k miles on at 6600k miles. Rear tyre lasted to 5k front still got plenty left on it. 40 to 50 MPG amazing. No oil usage or any issues so far. Bought from local dealership, hassle free and informed staff. Also had a demo to try. All in all very sweet experience. Had trade in so change over price was much better that other local dealerships for a similar bike. Aprillia Caponord, looks, character and very underrated. When purchasing our first tourer we tried all the makes available, I really wanted a Multistrada but was very disappointed with the vibration and snatchy feel. My wife also found it very uncomfortable as a pillion. V-strom, triumph tiger 8 & 12, BMW Gs. A friend suggested the Caponord, which we had not heard of. Following a test we fell in love with it, perfect all rounder. Confident feel cornering, braking is just superb, although I am comparing them to the TL100s and a ZX9R! Strong, pulls like and Ox and the exhaust note is intoxicating. So far after 7500m covered it hasn't missed a beat even in extreme temperatures as we just found out in Southern Portugal. Should be a five really, but on the first service some of the seals needed replaced (warranty work and free of charge) but I had only covered 1000m. Overall looks, although I guess it's a marmite bike! Dash display and gadgets are great, so easy to alter suspension settings with the touch of a button. Rain, tour and sport. The travel model comes with rear panniers which are a good size and waterproof, always a bonus. You can buy an Aprillia top box, but it's way to small. We fitted a Hepco and Beck, the journey model. Comes in gloss black and looks like it came with the bike. Tyres, Dunlop Qualifiers as standard which were great if you can afford to change them every 2500m, we have fitted Michelin Pilot Road 4s (GT), great in the wet and dry and seem to be lasting very well. Purchased from a dealer locally, well our only Aprillia dealer in the South West. We bought the Demo model as it was in black, my colour choice for £10560. They also had a new one in Red for nearly £12000. No budge on price really, it did only have 150m on clock. But we got lots of discount on some extras etc. Power and torque everywhere. Great sound with Arrow exhaust. Ride by wire throttle jerky in sport mode at lower speeds. Rain mode helps keeping to limits around town. Unknown yet. MPG lot better than some of the stories - in fact impressive. Got 50-52 mpg on a 250 mile run in Touring mode with some fast riding. JUst over 200 miles full tank to fuel light. Suggests another 50-70 left in reserve? Got mine from a dealer - Hunts in Manchester. Paid asking price of £9599 but fitted sat nav, topbox plate at cost and delivered 250 miles away for free. Great service - very helpful. Difficult to nit pick really.Screen replaced with MRA screen,much better looks and performance. Better with Avon Storms in performance and mileage. Front preload up 2 complete turns from standard. Strangely suspension better after 3000 miles. Performance and comfort A1. Addictive. Love it. Wish MCN could manage to get bike details correct rather than mislead. 118 mph, was that the bike you couldn't work out on test that was automatically restricted until 600miles. Cos it certainly isn't a true statement about the Caponord after the running in period. Also you need some new counting beads when it comes to estimating tank range...24litres = about 53 gallons which at 55 mpg gives a tank range of 290 miles. Waste of time readng the rest as it's all more accurately reported elsewhere. Waste of money buying your paper s well come to think of it. The bike ? FANTASTIC if a bit heavy.